We just can’t get our heads around something so beyond description. Last week when we were in the Arctic, God gave us a picture. Click on the video and feel his love for you in a new way. How has God revealed his love to you? Just leave your testimony in the box below. 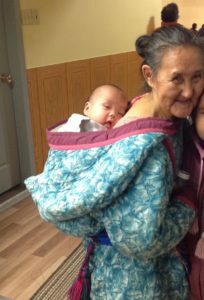 I felt warmth when we were invited to think of ourselves in a parka coat for baby carrying. I imagined right away that God was moving around above creating the earth and I was in his parka getting to see it and be part of it. I was in delight on his back. I was a silent partner in the back, indirectly involved. This is of personal interest to me because I’ve labelled my parents as emotionally distant and non nurturing in the past. But in my most recent healing prayer, what came to my mind, was how PRESENT my parents always were. I didn’t get taught with alot of verbal instruction, but i always had shelter, food and clothes basics. My parents were loyal and excellent in providing basics and in physical presence. My connection to this video is to be ok that my parents didn’t teach me verbal things. God just had me PRESENT in the parka while his attention was totally focused on creating the world. I see a parallel between my being in God’s back part of his parka with how my parents parented me. Both my parents and God gave me many opportunities for learning in alternative ways. I don’t need to feel misfited or sad or neglected or incapable or without in regards to how my parents parented me. I release those thoughts in Jesus’ name. I am worthy because of who I am as a child, as God’s child. I am wanted even when I am not the center of attention. I am wanted even when I am not given attention. I am wanted when care is delegated to others. I am wanted when I am left to entertain myself; entrusted to God. I am wanted when provided for in alternative ways. I am still loved when i am left to determine how to spend my time myself. Perception matters alot. My thinking is changing. Praise God!